Growing up I was a tomboy. I loved climbing trees, riding on snowmobiles and ice skating in Massachusetts where I was born. We moved to Tennessee when I was 10 and from then on I played softball, swam, rode bikes, took classes of some sort in the summers (dance, gymnastics, ballet). I stayed active and never thought about my weight. I remember my mother drinking Tab and keeping sugar out of the house, because she was always dieting and she encouraged my sister and I to watch our sugar intake so we didn't get fat. Once I hit age 14, I was in constant competition with my best friend, trying to be the same size she was. We went on diets constantly trying to get the perfect model-size body. This was in the era of Cheryl Tiggs and Charlie's Angels. I remember even going on ice cube diets. I was a size 7 but all I saw in the mirror was thick thighs and thick waist. I remember a friend in high school that would wear a bandana as a belt, and I envied her for that. Of course I never took into account the fact that she had a long and lean build, whereas I have a short (5'3″) athletic build. From that time on, I was always dieting. In my 20s I started lifting light weights and doing The Firm videos after they came out. I loved what squats and pushups did for my build. My body puts on muscle fairly easily. In my later 20s I got burned out with the routine I was doing and I started running instead. I wasn't very good at it due to asthma, but I absolutely loved pushing myself to the point where it hurt to breathe in. I did 5Ks and for awhile every Thanksgiving morning my sister and I would meet in our hometown for the Autumnfest 8K. It was crazy, usually in the 30s and one time it was in the 20s. When I turned 37 I discovered the local recreation department offered tae kwon do classes. I signed up and never looked back. It was the best of both worlds, building muscle and pushing yourself until you're gasping for air and think you'll pass out. I LOVED IT! 3 nights a week for 2 hours I was giving it all I had, even sparring with the men. I worked out for another hour 3 other nights in my garage with a punching bag. And I was good at it! 5 years 2 broken bones and torn ligament in my finger later, I tested for my black belt. I was in the best shape of my life. I had washboard abs, shoulder muscles that popped out and strong legs. But all this time training had really hurt my home life. I had really neglected my husband and I felt guilty. Stress took hold and I lost my appetite. For 3 months I ate very little, and my muscles were the first to exit. Needless to say, the weight started climbing at that point. I stayed with martial arts for another 2 years but I had torn ligaments in my hip from overuse and my back always hurt. I finally realized it was not worth the pain. I took up a new hobby, watching television and spending time with my husband. I tried Weight Watchers and a couple online diet companies. None were possible for me to stick with. I was used to being able to eat anything I wanted, these diets left me starving. I tried Atkins but couldn't live without carbs. I lost some weight with Thrive which was a plan created by a local man. He now calls it Shiboleth. It was doable but for me impossible to stick with. It limits carbs and fats too much for me and left me without energy and feeling weaker than ever. In 2012 I signed up with My Fitness Pal where I came across a group called Eat More to Weigh Less. I read all about it and found it to be very sensible. But I couldn't stomach a reset. I mean I just wouldn't do that. So I just watched my calories through MFP, trying to stay with 1200. I failed most days but even when I stayed on it, I couldn't seem to lose weight. I think it's because I had lost so much muscle, but losing my mother and menopause were major reasons also. In 2017 I faced the fact that I needed to quit dieting and learn to accept myself the way I am. I got back into the gym a couple nights a week and did whatever I wanted. Walked, punched a bag, pushups, it didn't matter as long as I did something. I knew exercise would help my mood and attitude more than anything else would. I also started looking at the EM2WL website and Facebook group, where I came across the announcement for the workshop in the Fall. I signed up thinking it would just be instructions for how to get started with a reset and how to move through the phases. Boy was I wrong! (But for the better!) 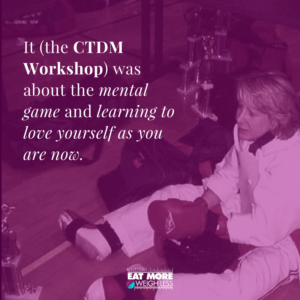 It was about the mental game and learning to love yourself as you are now. I really needed that. 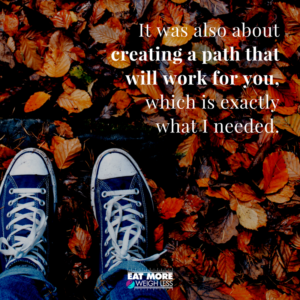 It was also about creating a path that will work for you, which is exactly what I needed. I am now in my first cut phase. It hasn't been easy because we're just coming off the holidays and I've probably been in the maintenance phase as much as I've been in the cut phase, but I know now how to analyze what I've done and I know I can change the rules to make them work for me. I'm also using the EM2WL Workout app to work out and I absolutely love it! It's the guidance I need. I'm definitely increasing my strength. My clothes are starting to loosen up slightly around the waist. I haven't weighed myself and I don't know that I will. If I'm building muscle, which I'm sure I am, then the weight won't go down. But I will measure in a month or so and I do think I'll like what I see!